Danna's Radio Diner – Radio shows Archive – Interviewing Interesting People, Places and Subjects. 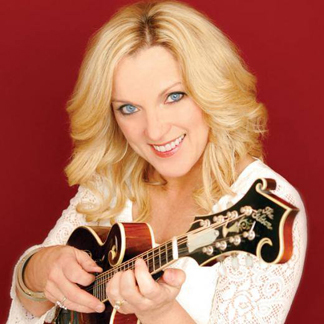 Rhonda Vincent (born July 13, 1962, Kirksville, Missouri) is an American bluegrass singer, songwriter, and multi-instrumentalist. The Wall Street Journal has proclaimed Vincent “the new Queen of Bluegrass”. Vincent’s musical career began when she was a child in her family’s band The Sally Mountain Show, and has spanned more than four decades. Vincent first achieved success in the bluegrass genre in the 1970s and ’80s, earning the respect of her mostly male peers for her mastery of the progressive chord structures and multi-range, fast paced vocals intrinsic to bluegrass music. Vincent is an in-demand guest vocalist for other Bluegrass and Country music performers, appearing on recordings by Dolly Parton, Alan Jackson, Tanya Tucker, Joe Diffie and other notables. She is the oldest of three children, and the only daughter of Johnny and Carolyn Vincent. Her brother Darrin is a member of the Grammy-nominated bluegrass group Dailey & Vincent. A fifth-generation musician, Rhonda’s musical career started when at age five, she sang gospel songs with her family’s band, which was later known as the “Sally Mountain Show.” Her father bought her a snare drum for her sixth birthday. At age eight, Vincent started playing mandolin. She soon excelled and began guitar lessons at ten years old. She later added fiddle to her list of instruments. In an interview with Ingrams magazine she said, “Dad used to pick me up after school, and Grandpa would come over and we played until after dinner almost every night. There wasn’t a lot going on in Greentop, but it was always hopping at the Vincent house. This entry was posted in Danna's Radio Diner Archive and tagged Bluegrass Music, Country Music, Country's Family Reunion, entertainment, fiddle, Larry's Country Diner, mandolin, Queen of Bluegrass, Sally Mountain, The Rage. Bookmark the permalink.